The waste industry is big business. Since I've been working at the Environment Agency, it has grown and rapidly developed and changed. There has been a move away from the use of landfill and with more waste being re-used and recycled. As an Environment Officer who works in a waste team I've experienced first-hand the changes that are taking place in the industry. I'm lucky as my role covers a variety of work, but broadly my responsibilities are to help businesses and industry to manage their waste responsibly by obtaining relevant permits and meeting appropriate standards. Waste crime, however, still exists and can range from large-scale dumping of waste to more organised complex illegal waste activity. It can have major implications on legitimate businesses, local communities and the environment. Stopping waste crime is a large part of my job and is something I am very interested in and enthusiastic about. One of the main offences I come across in my job is people who illegally tip large amounts of waste in the countryside or on someone else's land. This is an illegal action. People who break the law by dumping have no regard for the damage this causes the environment, the landowner or the people who live nearby. I began my career by investigating small illegal waste sites, set up without a permit, which could be stopped or brought under regulation fairly easily. As I have gained more experience at the Environment Agency, I’ve been involved in a number of larger, more complex, investigations. Recently I led an investigation which resulted in an individual receiving a 7-month custodial sentence for operating a large illegal waste site in South Derbyshire. Complex investigations are never straight-forward and require persistent effort. Not only to stop and disrupt the illegal waste dumping, but also to ensure the offender is brought to justice. This was one of the worst cases I have come across as the offender showed a complete disregard for his actions. 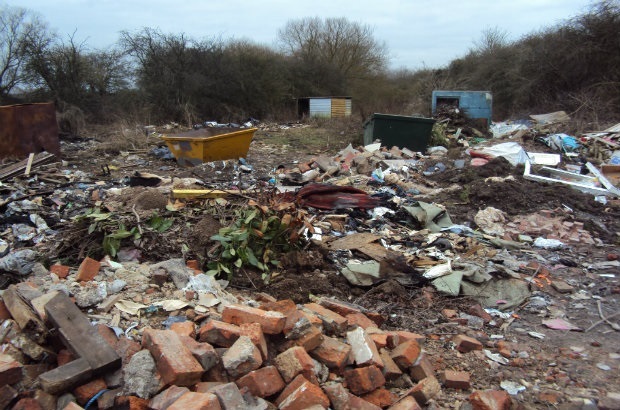 He had previously operated two other illegal waste sites at different locations and had already been warned and fined by the local council. I began my investigation when the illegal site operator trespassed on to land owned by a local vulnerable couple. He began importing large quantities of mixed waste and burning it on the land. Despite not having permission to be on the land and knowing he was being investigated, he refused to stop. He even broke the landowners’ locks, which meant we had to organise surveillance and put a large concrete block in the entrance to stop him gaining access. Despite this he continued to bring more waste on to the site. He caused the landowners a significant amount of worry and stress and showed no remorse for the harm caused by his actions. Throughout the case I worked with a range of internal and external customers including the police, fire service, local council Trading Standards and local complainants. In court the offender was ordered to pay over £20,000 in compensation to the landowners to help with the clean up. Achieving these outcomes and making a real difference to local communities and the environment is extremely satisfying. I hope that this shows people that we are serious about taking tough enforcement action against waste criminals. Considering the mess inconvenience and profits made by these criminals their sentencing is a joke. Mandatory 5 years at least.